One night a dry shampoo saved my life…. Excuse the cheesy title, I had it in my head so have to go with it! 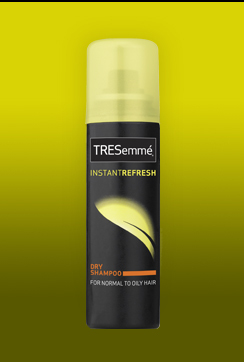 I’ve been meaning to blog about the TRESemme Instant Refresh Dry Shampoo for quite some time, but basically since I had my fringe cut in this has been my absolute saviour. If you have a fringe, or short hair then you will no doubt understand – having hair that sits on your face basically results in grease-central. I find that my fringe tends to get oily very, very quickly so using a dry shampoo is refreshing and stops my fringe from doing that thing where it goes all separated and ‘bitty’. I like this spray over some of the others I have tried so far as it smells nicer and doesn’t have the same sort of ‘powdery’ effect as some do. It feel pretty much invisible, yet does the job. My only slight whinge is that I wish they did a smaller can of this so I could take one in my handbag. I currently have mine stashed in my desk at work – but a smaller, more portable version would be fabulous. There is also a mousse that is designed for dry/frizzy hair, this doesn’t work for my hair type (although I desperately wanted to as it sounded fun). Nothing worse than lovely dry normal hair and a big ole greasy fringe…I always get that! I’ve always used the good ole batiste but I might give this one a try!